The University of Oregon Ducks’ dominance of the Florida State Seminoles in last night’s Rose Bowl forced the country to sit up and pay attention to what is happening in Eugene. Interest was piqued when Oregon made it to the national championship game against Auburn in 2010 and now they have returned looking faster and stronger than ever. Oregon successfully did what no other team in the Seminole’s last 29 games was able to accomplish: get a lead, hold it and hand Jameis Winston the first loss of his college career. The Ducks faced little resistance from the Seminoles in the second half, the time that Winston has been known for stepping up his game and carrying his team to victory. Head Coach Mark Helfrich wanted his team to play a cleaner game in the second half after penalties allowed FSU extra opportunities to catch them. If there is an area for Oregon to improve it will be making sure they play a clean game, six penalties for 50 yards last night didn’t’ sink them but against a strong Ohio State team giving away yards will not help them win a championship. In the second half Oregon showed everyone exactly how physical this team is. The third quarter was highlighted by the defense forcing three fumbles, all of which were turned into scores. Twice by the explosive offense and a 58-yard recovery by Tony Washington who also had a sack in the game. The often overlooked defense held FSU in check, allowing 528 yards but only 20 points. 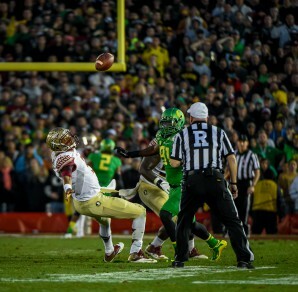 Their red zone defense allowed Oregon to maintain their lead and work the Seminoles into a corner. In addition to another incredible defensive performance, the offense saw its share of playmakers and not the names we have been seeing all season. Darren Carrington, who had his first 100+ receiving game of the year in the Pac-12 Championship game, hooked up with Marcus Mariota seven times for 165 yards and two touchdowns. Royce Freeman was a crucial piece for Oregon, forcing FSU to respect the inside run but Thomas Tyner enjoyed the spotlight carrying the ball 13 times for 124 yards and two touchdowns. When the Ducks and Buckeyes face off in Texas on January 12th for the first national championship game following a playoff format, the Ducks will have plenty of weapons to work with. In part that is what makes Mariota and the offense so dangerous; they do not rely on one or two guys, it is always a team effort. The Ducks will need everyone to play their best to win the day against the Buckeyes, the last hurdle on the road to being crowned National Champions.